I enjoyed Clockwork Angel, but Clockwork Prince is the book that cemented my love for The Infernal Devices series. Why is that? I'm not exactly sure why love it so much. It has that intangible "something" that has no formula or no real description. The Infernal Devices series differs from The Mortal Instruments in that the characters and the romance are the focal point of the books. Not that The Infernal Devices stints on the action or that The Mortal Instruments as insufficient character development, but the series have different feels. 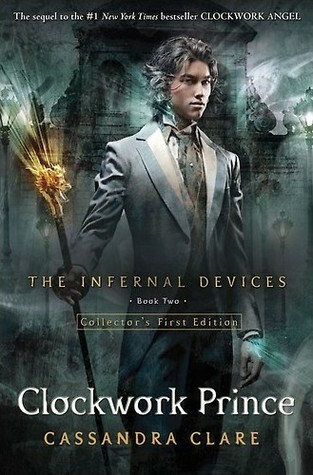 Overall, I like The Infernal Devices's focus better than The Mortal Instruments. "[Will] sounded exhausted, Magnus thought, and dramatic in that way that only seventeen-year-olds could be." (pg. 152). Will can be a bit of a drama queen. He spews vitriol at those he loves but also shows pure despair with Magnus, who he trusts and respects. I could sense Magnus's age more in this book, especially in contrast to Will. All the things that are fresh and desperately important to Will are dampened to Magnus. Not because he feels less but because time has shown that there are things that are more important than one's own heartbreak. Jem also comes into his own in Clockwork Prince. The book contrasts Will as fire and Jem as air. I think that's a fabulous description. As much as I love Will, I can't help but love Jem equally, but in a different way. Jem is pure goodness. Disliking him would be like kicking a puppy. Unthinkable. Like Will, Jem is in love with Tessa. We see that Jem is also capable of passion. The romance between Jem and Tessa is the kind that any girl would cherish, all sweetness and softness. One of my favorite things about Clockwork Prince and the The Infernal Devices series in general is just how much is going on. Will, Tessa, and Jem's collective and individual dramas are a large part of the book, but the side stories of multiple characters play significant roles as well. I love the depth that this series has. There are quite a few major players in this series: Tessa, Will, Jem, Jessamine, Charlotte, Henry, Magnus, Sophie, Gideon, Gabriel. There are even more lesser characters who influence the plot. Each major character has an individual side story. Miraculously, Cassandra is able to write about all of these without dragging the book down. As I expect from Cassandra's books, Clockwork Prince is full of action, even though it is a less action oriented novel. Tessa and the others are trying to learn more about Mortmain with the intent of defeating him but also to prove that Charlotte is proper head of the Institute despite her gender. There are fights galore, unexpected re-acquaintances, shocking betrayals, and so much more. In some ways, Clockwork Prince had a second book feel but mostly it did not. It is a bedrock of the main story rather than a mere bridge between the first and third books as so many second books are. I now have a good feel for each of the characters and have developed emotional attachments to them. This is the book that makes The Infernal Devices truly stand apart from The Mortal Instruments. I highly recommend it. This is a honkin' big book/series so I'd think it would need a lot going on to keep it interesting. Even though some may fuss about Clare's fanfiction-writing past and all that muck that went with it, she can seriously balance some amazing storylines and characters. So happy you liked this book. I still have the last book to read. In fact, I have so many books to read that I feel like I'm falling behind. GAH! I need to finish this series. I didn't think this one had "middle book syndrome" at all. We did get a lot of background information and for me, this book showed me that I judged Will too quickly and had written him off as another Jace type character. I really felt for him in this book and like you said, I like him almost as much as Jem. Great review. I just finished reading this book myself.